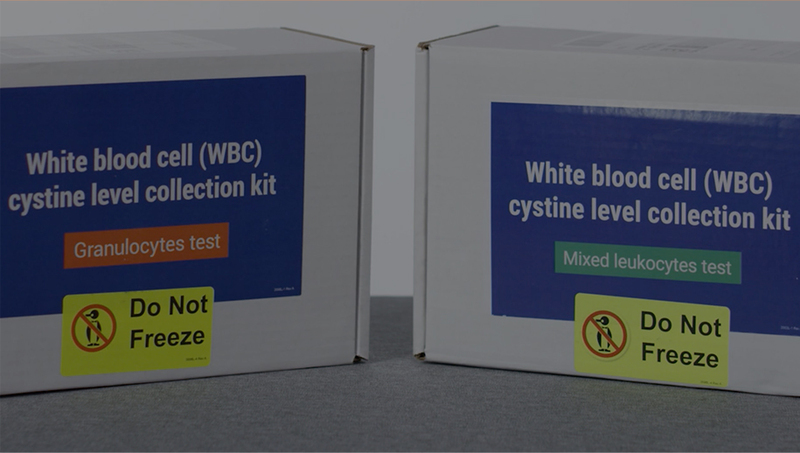 The way to know how well patients' cystine-depleting therapy (CDT) is working is through regular white blood cell (WBC) cystine level testing. To help monitor cystine levels, Horizon will provide a collection kit free of charge for doctors to give to their patients. Doctors can order a kit from a Horizon representative. The Horizon representative will deliver the kit to the doctor's office. The kit includes patient instructions that doctors should review with their patients. Patients should take the kit to a laboratory to have their blood drawn. Watch this short video for important instructions for doctors, patients and caregivers, and lab employees to properly use the collection kit. Doctors must complete the requisition form. Doctors must complete the appropriate requisition form included in the kit for either UCSD or Baylor Genetics before the blood-draw appointment. Patients should schedule their blood-draw appointment for Monday through Thursday. The blood sample must be shipped the day it is drawn, and UCSD or Baylor must receive the blood sample the next day. Blood-draw appointments should not be scheduled on Fridays, weekends, the day before a holiday, or late in the afternoon. Patients should schedule their blood-draw appointment right before the next dose of CDT. Schedule the appointment close to when the patient would take their next dose of CDT. That’s when cystine in the blood approaches its highest level. The patient should bring the collection kit and a completed requisition form to the blood-draw appointment. The kit contains everything the lab needs to get the blood sample ready and shipped for testing. Lab employees must cool the blood sample, but never freeze it. Immediately after drawing blood, lab employees must place the blood sample in the activated NanoCool® unit so it arrives at UCSD or Baylor cool, but not frozen. Lab employees must check to be sure the cooler is cool before shipping. About 1 minute after the NanoCool unit is activated, it will feel cool and the logo will turn blue. If it’s not cooling, the lab should not ship the blood sample. The lab must ship the kit the same day that blood is drawn. The lab must send the blood sample by overnight delivery so it arrives for analysis the day after blood is drawn. A prepaid FedEx label is attached to the box. will never be shared with Horizon Pharma. The information provided in this site is intended only for the residents of the United States. The health information contained herein is provided for educational purposes only and is not intended to replace discussions with a healthcare provider. You are leaving WBCKit.com You will be redirected to a website that is operated by an independent third party. This link is provided solely for your convenience. You are leaving WBCKit.com You are about to go to a website that is sponsored by Horizon Pharma. Would you like to continue? You are leaving WBCKit.com You will be directed to a product website to learn more about a medicine for cystinosis.